CNet's Charles Cooper explains why he changed his mind about nuclear energy. Given the choice between nuclear power and rolling brownouts for the rest of my life, I'll take nukes. Given the choice between nuclear power and the real possibility of death from pollution-related respiratory disease, if I had any say in the matter, I'd gladly take even more nukes. And given the choice between nuclear power and climate change, no contest. I'd get every watt I could possibly get from nukes. Who Are WCBS-TV's Nuclear Experts? Since the beginning of the week, we've been busy following the developing story coming out of Peach Bottom Nuclear Power Plant in Pennsylvania, where a hidden camera video report by New York's WCBS-TV discovered a group of plant security personnel sleeping in the facility's ready room when they should have been wide awake and ready for action. Since word of the story first leaked out, Exelon, the owner of Peach Bottom, terminated Wackenhut's contract to manage the security force at the plant, as well as banished the officers in the video from getting back into the plant. In the meantime, we've got a bone to pick with WCBS-TV about one of the wilder claims contained in the report. "The Plumbers and Pipe Fitters Union will only support political candidates who support nuclear power. "Thanks, Bill. It's good to know who your friends are. Here's hoping the message gets out. UPDATE: Organized labor's support for new nuclear is a global phenomenon, with recent support coming from Scotland and South Africa. Here's a summary of what went on in the energy markets last week: Electricity peak prices experienced modest gains at all the hubs except for SP 15 and Palo Verde. SP 15 and Palo Verde decreased by more than $10/MWh last week as temperatures and demand receded (see pages 1 and 3). Gas prices at the Henry Hub rose from $5.85/MMBtu to $6.22/MMBtu. Storage inventories are currently 8.2 percent above the 5-year average, and about 1 percent below last year’s storage level at this time according to EIA (see pages 1 and 3). Gas futures at the Henry Hub for October 2007 rose to $6.30/MMBtu (see page 2). Total U.S. electricity production for the week ended September 15 fell 7.8 percent from the previous week. The weekly total was 5.4 percent higher than the corresponding week in 2006 (see page 1). Here's a summary of U.S. nuclear plant performances last month:For August 2007, the average net capacity factor reached 97.6 percent. This figure is 0.9 percentage points higher than the same one-month period in 2006. Monthly nuclear generation was 72.7 billion kilowatt-hours for August 2007, compared to 72.0 bkWh for the same one-month period in 2006. The nuclear generation for August 2007 was the highest month on record compared to all the other months of August for the previous years. For 2007, year-to-date nuclear generation was 544.8 billion kilowatt-hours, compared to 531.2 bkWh in 2006 (2.6 percent increase) and 519.4 bkWh in the record year of 2004. According to EIA’s Short Term Energy Outlook, preliminary weather information for August indicated cooling degree-days (daily summer mean temperature in Fahrenheit minus 65o F) were 24 percent higher than normal.For the report click here. It is also located on NEI's Financial Center webpage. There's a lot of traffic flying around about the video we're seeing coming out of WCBS-TV in New York of guards at the Peach Bottom Nuclear Power Plant taking a nap in the plant's ready room. Some other things to note: Exelon, the owner of Peach Bottom, has terminated the Wackenhut contract at the plant, and the guards seen sleeping in the video have been denied access to the plant. In the Canadian province of Ontario, work is well underway to restart Units 1 and 2 at the Bruce A Nuclear Power Plant. Ed Willet, a freelance writer, recently toured the facility and came away impressed. Nearly 9 out of 10 New Jersey voters agree that more needs to be done to increase the state’s electricity supplies and, by a 2 to 1 margin, support the use of nuclear power to meet that need, according to a new poll released today by the New Jersey Affordable, Clean, Reliable Energy Coalition (NJ ACRE). Although the survey showed a majority believe nuclear power to be safe, reliable, affordable and clean, most had no idea that more than half of the electricity consumed in New Jersey comes from nuclear energy plants, placing the figure instead at only 26 percent. Speaking today at the New Jersey AFL-CIO conference in Atlantic City, Dr. Edward H. Salmon, chairman of the Coalition and a former president of the New Jersey Board of Public Utilities, told the assembled union leaders that the poll underscored the need to educate the public to all available clean energy options. My apologies for the lack of posts today, as I was down on Capitol Hill this morning for the press event announcing NRG's license application with NRC to build an additional two reactors at the site of the South Texas Project. For more details directly from NRG, click here. I was at the event with my video camera, so I should have some footage to share later this afternoon. Congratulations to everyone at NRG and STP on taking an important first step -- one that hasn't been taken in the U.S. since 1978 -- on the road to building America's next new nuclear reactor. By now, I'm sure most of you have seen the news that NRC has sent a team to Exelon's Peach Bottom Nuclear Power Plant to investigate allegations that security personnel at the plant had been "inattentive" while on duty. That news followed items in the press from last week that one or more security guards had been caught on videotape sleeping on the job -- footage of which will reportedly be shown tonight on WCBS-TV in New York. Earlier this afternoon, Exelon announced that it had completed its own internal investigation, and that it was terminating Wackenhut's contract to manage security forces at Peach Bottom Nuclear Power Plant effective immediately. Demand for primary uranium and conversion and enrichment services is rising substantially as reactor new-build programs advance. Decades of chronic underinvestment in the fuel cycle, limited new uranium production, concerns over global warming and energy security, and dramatic shifts in international geopolitical powers are creating highly volatile and nonrational behavior in the world nuclear fuel supply markets. Although new financial instruments may allow producers and buyers to manage uranium price risk, innovative approaches to expedite the financing, permitting and licensing of new fuel cycle infrastructure and for fuel procurement are urgently needed. Click here and here for details from Ontario. As always, for the skinny on Canadian energy issues, check out Stephen Aplin. A discussion at Asymmetrical Information. Between Dominion's power plants, Pittsylvania's uranium mines, Lynchburg's nuclear manufacturing/service companies and Northrop Grumman's shipyard, Virginia has the potential to assemble a world-class nuclear power cluster -- not just mining, but designing, manufacturing, installation and servicing. With all those capabilities concentrated in a small geographic area, who knows what synergies might develop?Who knows, indeed? UPDATE: Critical Miami is liking what it's hearing these days too. Joseph Mangano is up to his old tricks again, this time in Missouri. For the truth about what he's up to, click here for a look at our archives. Now that India is committed to beefing up its own domestic nuclear energy program, it's beginning to worry about China's efforts to secure its own future supplies of uranium. 'Scotland requires about 5.5 to 6 gigawatts of electricity to keep its offices running, its homes warm and its factories working,' he points out. 'We can now generate almost 10 gigawatts and export the excess to England. With no replacements for Hunterston and Torness, that will stop. Nuclear power now provides 40 per cent of our power baseload. Without it, we would end up importing power and I don't see how a country seeking full autonomy can justify that. 'For those of you who aren't familiar with the situation, the current government in Scotland is poised to both oppose any effort to build new nuclear plants in that country, as well as work to prevent any moves to extend the operational life of its current nuclear fleet. Last Friday, Gary Petersen and a group of parents and students involved in home schooling in the Toledo area visited the Davis-Besse Nuclear Power Plant. Congrats to Chip Palazzo and everyone at First Energy for continuing to reach out to the community and tell our industry's story. A Green Nuclear Future for New Jersey? [B]oth wind and solar will remain small parts of the energy mix for the foreseeable future. We will still need large power stations that can supply electricity with zero- or low-carbon emissions--and do so abundantly around the clock throughout the year and not just on sunny or windy days. Nuclear stations are the greenest option available to provide this power. The most widely discussed alternative--carbon capture and storage technology--needs to be developed but is a distant and uncertain prospect at this time. I know we talk a lot about electricity generation here at NEI Nuclear Notes, but it's important to remember that there are plenty of other peaceful uses of nuclear technology that deserve some attention. Over at Wired, they're looking at how companies building space probes are beginning to push for new developments in nuclear propulsion. For more on nuclear propulsion in space travel, click here. Details from the Globe and Mail. Details from the Deseret Morning News. Details from Tennessee Journalist. Patrick Moore is on the agenda. For more on GNEP, click here. Earlier this week, I pointed to a New York Times Magazine piece by the authors of Freakonomics that asked what effect Jane Fonda and the movie The China Syndrome had on the American nuclear energy industry and U.S. emissions of greenhouse gases. Last week, NEI's President and CEO, Skip Bowman, addressed the Commonwealth Club in San Francisco. The topic: "Clean Energy for California". To watch the video, use the player that's below. For the text of the speech, click here. The Nuclear Energy Institute’s (NEI) Engineering Department has an immediate opening for a Project Manager (PM). The initial assignment will be to manage the regulatory interface on fire protection issues. Responsibilities will change over time in response to regulatory pressure, industry priorities, and personal experience and interests. Minimum requirements for the position are an engineering degree and at least 7 years experience in the nuclear industry. Other important attributes include nuclear plant systems experience, project manager experience and familiarity with fire protection related regulations. Details from the Palm Beach Post. For some more data on power uprates at U.S. nuclear plants, click here, here and here. Cosmic Log has the details. Should Democrats Embrace Nuclear Energy? Now is the time for Democrats to champion real solutions (note: that's plural; there are more than one solution) that don't require fossil fuels. Nobody is saying that efficiency, conservation, or renewables should be discarded. On the contrary, they are absolutely essential. But to leave out nuclear energy -- the one energy source that has proven itself in the US, in France, in Japan, and is today proving itself in over 400 currently operating reactors worldwide -- is simply ludicrous. Democrats should say yes to nuclear energy. Now is the chance to provide real answers to one of the most important questions of our time: how will we live and where will the energy come from? The opportunity is too great to pass up.For more, read this Boston Globe op ed from John Dyson and Matt Bennett. Comparing the environmental footprint of nuclear versus coal was the most persuasive mind-changer for Cravens. Coal involves vast quanities of mine spoil, vast quantities of fuel, vast quantities of pollution (including mercury and uranium), and vast quantities of carbon dioxide poured into the atmosphere. Nuclear, by contrast, uses the most concentrated form of energy in the world, the plants are small, and the waste amounts to one Coke can per person’s lifetime of energy use.For more, stop by O'Reilly Radar. John Wheeler is back with his nuclear energy podcast after a Summer hiatus. Welcome back, John. Blame It All on Jane Fonda? If you were asked to name the biggest global-warming villains of the past 30 years, here’s one name that probably wouldn’t spring to mind: Jane Fonda.Read it all to the end. I'm curious to see what folks think. For those of you too young to remember Three Mile Island, click here for the NEI fact sheet. For other views, see We Support Lee and Peter Magnuson. The mortality rates the report cites comes from the National Center for Health Statistics of the Centers for Disease Control. The website with the data can be found here. A US Department of Energy (DoE) study found that 73% of the nearly 217 million vehicles on America's roads could be charged with existing power plants to generate the electricity to charge the cars - and greenhouse gases would fall by 27% as a result. Is Mario Cuomo Another Democrat for Nuclear Energy? Over at DMI Blog, former New York Governor Mario Cuomo has been writing a series of posts on new priorities for progressive politicians. Today, he turned to his suggestions for strengthening the economy, including his ideas for energy policy. In the nuclear energy business, Cuomo is best known for leading the opposition to the opening of the Shoreham Nuclear Power Plant on Long Island -- a plant that was complete and ready to begin providing reliable, emission-free electricity to a region that has traditionally paid some of the highest utility rates in the nation. The article in the Times Dispatch doesn't talk much about nuclear other than the issue of uranium mining, but if you go through the actual plan (PDF) there is plenty of discussion. All in all I'm impressed with this Democratic governor's embrace of nuclear as one of Virginia's core energy assets, though there are a few lines here and there that rankle me (operational costs [for] nuclear are higher than solar and wind? ).Interesting stuff. Again, click here (PDF) for a copy of the plan. Following up on the link we provided to yesterday's debate at Shakesville, Rod Adams has done a nice cost/benefit analysis on the Price Anderson Act. For more information on Price Anderson, click here. Here's a summary of what went on in the energy markets last week:Electricity peak prices all decreased across the country last week except for ERCOT. In the West, the Palo Verde and SP 15 hubs decreased by more than $28/MWh after the summer heat wave receded. Price declines of less than $2/MWh occurred at the Eastern hubs (see pages 1 and 3). Gas prices at the Henry Hub rose $0.03 to $5.60/MMBtu (see pages 1 and 3). Due to low natural gas prices, Chesapeake Energy Corp. announced it will cut 6 percent of its gas production in September. Gas futures at the Henry Hub for October 2007 were $5.65/MMBtu. For September 2008, Henry Hub futures were $7.68/MMBtu (see page 2). TradeTech’s and UxC’s uranium spot prices remained unchanged for the week. Average uranium prices for the current week, last four weeks and the past year are about $90/lb U3O8 (see pages 1 and 3). The fall run of NEI’s “Nuclear. Clean Air Energy” branding advertising begins this week with print advertising in The Washington Post (Page A12 today) as well as The Washington Times, National Journal, Congressional Quarterly, Congress Daily, CQ Today, The Hill, Roll Call, State Legislatures and Governing magazine. The campaign also includes morning drive radio advertising on seven inside-the-beltway radio stations and television advertising on news and public affairs programs such as Meet the Press, News Hour, The Situation Room and various other CNN shows. To view the television ad, click here. The campaign extends through the last week of September. 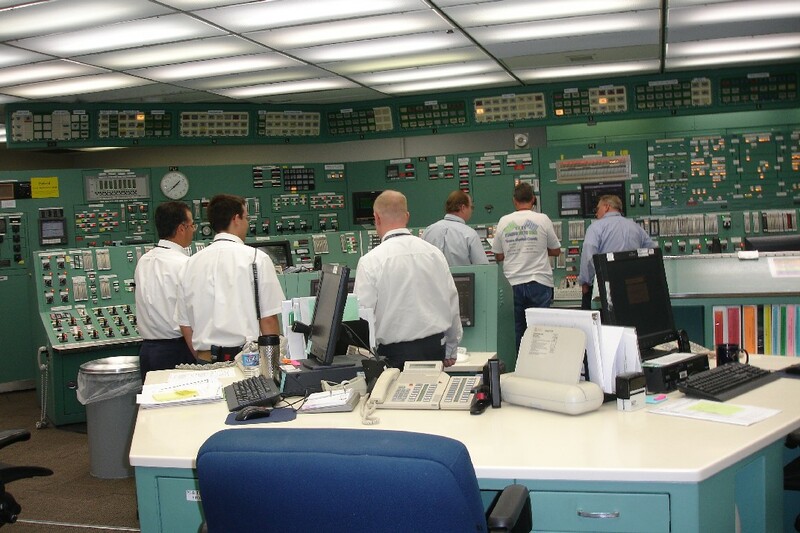 Here in the U.S., we like to talk about how nuclear power plants enjoy strong support from neighboring communities. As it turns out, you can also find that kind of support in the U.K. as well. For more on the strong public support nuclear energy enjoys in the U.S., click here. For some encouraging poll results from the U.K., click here. He's in Michigan, on the case for the CASEnergy Coalition. Coverage from the Ann Arbor News and the Detroit News. Say hello to David Danielson of the MIT Nuclear Blog. The Wall Street Journal takes a look at the debate over how to constrain carbon emissions. Would you feel better about the environment by filling up on electricity generated by a nuclear plant than plain, old gasoline? That’s one of the questions Toyota may face as part of a partnership with Electricite de France announced Wednesday at a glitzy Toyota showroom on the Champs-Elysees in Paris. The companies are setting up a “smart network” of plug-in points and household sockets that would charge users for filling up on French electricity, most of which comes from the country’s dozens of nuclear plants. Unlike coal, gas and oil plants, nuclear emits virtually zero carbon dioxide, although it does leave radioactive waste that troubles many citizens and environmentalists. By charging cars at night, drivers would emit virtually no CO2 because that’s when nuclear plants are providing almost all the country’s base load of electricity, said Pierre Gadonneix, EDF’s chief executive.I'd be willing to plug my car in at night? How about you? Click here for an interview with the Idaho Statesman. Before Knoxville News reporter Andrew Eder wrote about the Watts Bar project, he blogged about it. The Nuclear Regulatory Commission plans a public meeting Tuesday night at Northeast Alabama Community College on a proposed nuclear plant in Jackson County. A group of power utilities is expected to submit an application to the NRC on Oct. 31 for a license to build and run two reactors at the Tennessee Valley Authority's Bellefonte site near Hollywood. As part of that group, TVA spokesman John Moulton says the agency would be the licensee because it owns the site. NRC spokesman Roger Hannah said Tuesday's meeting will be for informational purposes only. He said the public is invited to ask questions. For directions to the campus, click here. Details from Energy Daily. For more, see We Support Lee. [A]s a native of Albuquerque, NM, she had the opportunity to develop a social acquaintance with Rip Anderson, one of the leading researchers and practitioners of probabilistic risk assessment of nuclear facilities. Do you believe nuclear power has a role to play in America's energy future? I understand the safety and security concerns with nuclear power and share many of them -- I live three miles away from a nuclear power plant. But nuclear power is an option to reduce global warming, which I don't believe we can afford to take off the menu of options, not when we rely on it for close to one-quarter of our power. However, the nuclear waste generated is an environmental hazard that I'm deeply concerned about. While the temporary solution of storing waste in dry casks may be safe, we must find a resolution to long-term concerns. We must invest in R&D to develop safe and secure ways for permanent disposal that will protect our environment, our water supply and our country's national security. We are not alone in this pursuit, and as president I will join forces with our allies around the world facing the same problem. Today's edition of The Telegraph (U.K.) is featuring an interview with Bill Coley, CEO of British Energy. For the most part, it's quite good, detailing Coley's rise through the ranks at Duke Power from his days working at a coal plant in North Carolina all the way to his elevation to President of the company. Unfortunately, while the story provides a full picture of Coley's tenure at Duke, the headline is more than a little misleading: How Britain's nuclear chief Bill Coley left the US under a cloud. As I dug through that information, I still did not find anything that indicated any blame associated with Bill Coley other than a statement that said that the audit "was silent" on his involvement. Details from We Support Lee. Details from The Times (South Africa). Scotland's First Minister says his country needs no new nuclear power plants. But others say he needs a "reality check". UPDATE: We Support Lee did some digging to buttress the argument. I am addicted to electricity. So are you. And so is your business. We live in an "always on" world—air conditioners, streetlights, TVs, PCs, cell phones, and more. And with forecasts that we'll need 40% more electricity by 2030, determining how we can realistically feed our energy addiction without ruining our environment is the critical challenge of the new century. Of course, we could buy energy-saving appliances or drive fuel-efficient cars. We can recycle cans, bottles, and newspapers. We can even plant carbon-absorbing trees. But, no matter how much we may wish they would, these acts by themselves won't satisfy our energy demands. To do that, we need a diverse energy mix that takes a practical, rather than emotional, approach. Should New Zealand Re-Think Its Anti-Nuclear Energy Position? Coming out of last week's APEC summit in Australia, New Zealand Prime Minister Helen Clark took credit for watering down some of the official statements about nuclear energy and climate change. That nuclear power poses risks is indisputable. But those risks need to be assessed in context of the certain - not potential - environmental havoc that is being wrought by the use of fossil fuels to generate energy. In the US, more than 600 coal-fired power plants produce 36 per cent of that country's - and almost 10 per cent of the world's - emissions of carbon dioxide, the primary greenhouse gas responsible for climate change. China is building a new coal-fired power station every week. Italy should restart nuclear power generation and European nations must improve cooperation on natural-resource policy to best deal with growing energy demand, a report prepared for Enel SpA, Italy's largest power company. Energy security necessitates a review of its fuel mix including the ``reintroduction of nuclear power in Italy,'' as well as the ``development of renewable energy'' sources such as wind, according to the report prepared for Enel by The European House-Ambrosetti, a business consulting company with headquarters in Milan. The report was presented today at a conference in Cernobbio, Italy, that was attended by Enel Chief Executive Officer Fulvio Conti, and European Energy Commissioner Andris Piebalgs. Federal regulators, girding for explosive growth in the nuclear power industry, say they are weeks away from an anticipated flood of license applications for new reactors not seen since the 1970s. "There are a lot of challenges for new construction," said Bill Borchardt, director of the Nuclear Regulatory Commission's newly created Office of New Reactors. "And a lot of challenges for the NRC." The independent regulatory agency expects to receive new fast-tracked combined construction and operating license applications for as many as 29 reactors at 20 sites, most in the South, over the next three years. The first could come as early as Oct. 1, the start of the federal fiscal year. "We have never had to do this many reviews at one time in parallel with an office that has only existed for less than 12 months," Borchardt said Thursday at the NRC's reactor training center in Chattanooga. "Nobody thinks this is going to be easy." Visit Politics in the Zeroes and Kiwiblog. Areva of France and Mitsubishi Heavy Industries of Japan announced that their newly-created joint venture will be known as Atmea. The joint venture will develop an "advanced Generation-III" nuclear power reactor, the Atmea 1. Here's a summary of what went on in the energy markets last week:Electricity peak prices varied across the country last week. In the West, the Palo Verde and SP 15 hubs increased by more than $23/MWh due to a sustained summer heat wave. Phoenix broke a record with 32 days over 110 degrees Fahrenheit. Cal-ISO issued several grid warnings and a Stage One emergency due to the heat. Peak prices modestly increased at NEPOOL and PJM West hubs, but declined by more than $7/MWh at the Entergy and ERCOT hubs (see pages 1 and 3). Gas prices at the Henry Hub fell $0.68 to $5.57/MMBtu (see pages 1 and 3). Working gas in storage totaled 2,969 Bcf as of Friday, August 24, which is 12 percent above the 5-year average inventory level for the report week, according to EIA. Details from Australia's ABC News. For the text of a joint statement between President Bush and Prime Minister John Howard, click here. "What's Left But Nuclear Power?" There simply aren’t that many rivers left to dam up. Solar and wind power are prohibitively expensive, consume large swaths of landscape, and lack the reliability needed to provide energy base load – that critical amount of energy needed to power the core of civilization. America can’t simply come to a halt on cloudy or windless days. What’s left but nuclear power, which safely generates 35 percent of Europe’s electricity from 196 nuclear plants across the continent? A couple of weeks back we pointed you to a clip from The Daily Show mocking the opponents of the Cape Wind project, including Senator Ted Kennedy. In a remarkable turnaround, liberals are now heaping scorn on the 73-year-old senator. Young audiences boo at his name, and the leftish "Daily Show" on Comedy Central makes fun of him. The source of unhappiness is Kennedy's efforts to kill an offshore wind farm on Nantucket Sound. Cape Wind was to be the first such project in the United States and a source of pride to environmentally minded New Englanders. Polls show 84 percent of Massachusetts residents in favor. But now it appears that America's first offshore wind farm will be near Galveston, Texas. Three leading sources of greenhouse gas emissions are our modes of transportation, our home-heating technologies and our means of generating electricity. Americans are, and will continue to be, considerable consumers of electricity. Our way of life is powered by electricity -- from lighting our houses, churches, hospitals and schools to charging our iPods, cell phones, computers and operating our transit systems. In fact, the Department of Energy (DOE) estimates that Americans will need nearly 40 percent more electricity by 2030. So how do we meet that growing energy demand without causing further damage to the environment? Conservation is certainly crucial critical to any comprehensive energy plan. Great gains in conservation have already been achieved in electrical use, and more can be done. But even aggressive conservation efforts alone do not provide the solution to future base load energy needs. A year ago, the leaders of Baltimore-based Constellation Energy Group and PPL Corp., its utility neighbor in Pennsylvania, represented the energy industry's sharp division over whether the revival of nuclear power was at hand. Mayo A. Shattuck III, Constellation's chief executive, said the economics were right for a nuclear comeback after 30 years of dormancy. PPL Chairman William F. Hecht countered that nuclear power was too expensive and risky, and that shareholders' money would be better spent adding pollution controls to his company's coal-fired power plants. Today, Hecht is retired, the cost of cleaning up coal is soaring and PPL is among the utilities talking with Constellation's UniStar Nuclear subsidiary about the potential purchase of a new reactor identical to one that Shattuck wants to build in Maryland. We Support Lee has the details. Stephen Aplin has the details. Also, check out some news from Northern Ontario. The most important piece of energy legislation passed in the state in a decade — An Act Concerning Electricity and Energy Efficiency — goes on for 85 pages. Signed into law in June, it mentions nuclear power three times: once concerning the assessment of special fees; a second time to state nuclear is not to be considered a renewable energy source; and finally to exempt it from a policy that will make it easier to build power plants at existing energy facilities. In other words, the legislature and the governor saw no role for new nuclear power in addressing Connecticut's energy needs. The subject remains a political pariah. Politicians fear the mere mention of it will bring out the protesters. That mindset needs to change.Read the rest right now. “When they change the law to require absolute assurance of perfect protection,” he said, “there won’t be a lot of nuclear reactors in this country. Also, there won’t be a lot of cars or McDonald’s.”That puts things in the proper perspective. Once again, our condolences to Commissioner McGaffigan's family and friends, as well as to the staff at NRC. He'll be sorely missed. The German Environment Minister, Sigmar Gabriel, has called for seven of the country's oldest nuclear reactors to be closed down immediately. Justifying his demand, Mr Gabriel pointed to recent breakdowns at two ageing nuclear plants. Germany is committed to phasing out nuclear power by 2020. Mr Gabriel told a German newspaper that it would be of great technical benefit from the safety standpoint to close the oldest reactors now. “Ed McGaffigan was a giant among public servants, a commissioner who brought great passion and competency to the Nuclear Regulatory Commission. “Commissioner McGaffigan was a voice of reason determined to assure public health and safety by advocating regulation that is rooted in sound science and engineering. He always voted his conscience, and he earned the respect of his colleagues and staff at the NRC, government leaders, the public and executives in the nuclear energy industry.